News flash...October! After seven months of designing and creating, Erin, Greg and I have completed our work on the "National Wall of Respect", a beautiful 43 foot by 9 foot mural for the Arc of Riverside County (www.arcriverside.org). This is the first mosaic mural to be created in the Inland Empire. The public unveiling was on October 25, 2013 at 5:30 p.m. at 8138 Mar Vista Court, Riverside, CA 92504. There were a few hundred people in attendance. Thank you to all of our family, friends and everyone at the Arc of Riverside County....it was an amazing night! If you were not able to come, please visit the "National Wall of Respect" at the above address. Please visit our Mosaic Mural website! Greg and I, along with several other artists, participated in the first Artisans Collective at the Festival of Lights in downtown Riverside between November 30 and January 5 2012. Erin Maxwell and Cosme Cordova coordinated the event for the City of Riverside and it was a huge success! 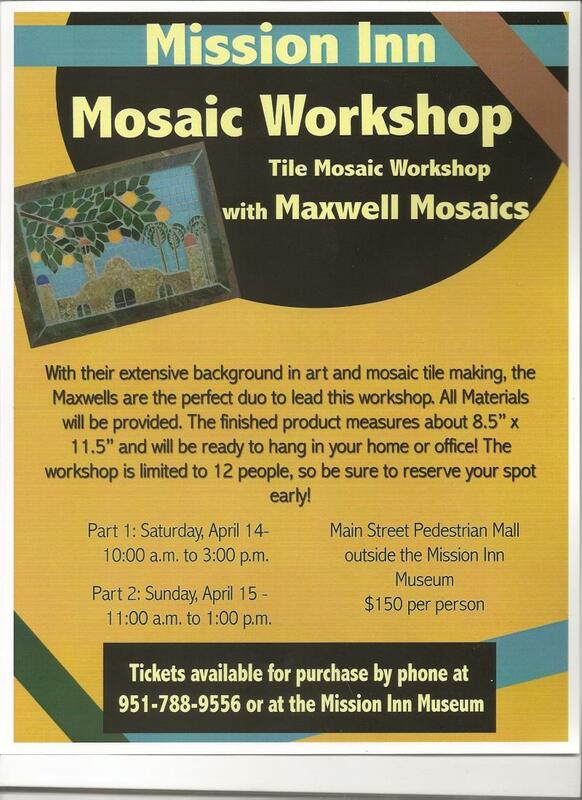 In December 2012, the Riverside Arts Council recognized Maxwell Mosaics as the Art Honoree of the month. Greg, Erin and I were very honored with the recognition! 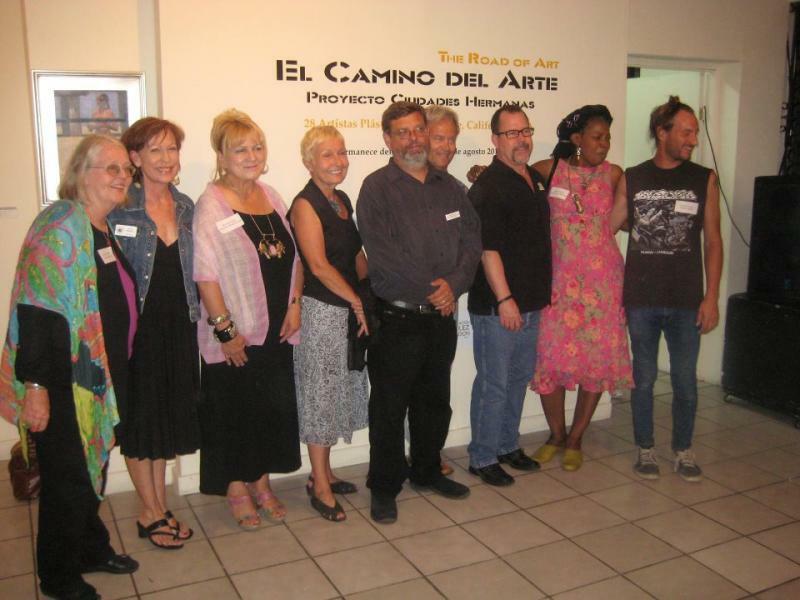 In July 2012, I traveled to Ensenada, Mexico with my daughter, Erin and 16 artists and friends from Riverside Community Arts Association. 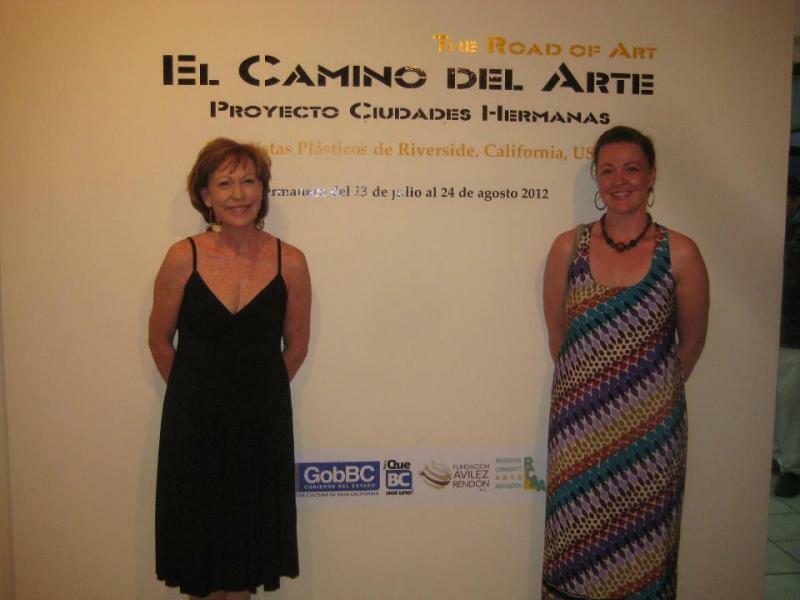 Our art was in an exhibit called "The Road to Art" at the Riviera Cultural Center. Mark Schooley, Executive Director at RCAA also had an exhibit of his art at the Terra Peninsular Art Gallery in Ensenada. The receptions were July 13th and 14th. The exhibit ran from July 13 to August 24th. This is my mosaic art, titled "Kapalua Summer". A very cultural and amazing trip! I am very happy to announce that I was chosen by the Riverside Arts Council as one of five artists for this biannual exhibit partnered between the Riverside Public Libraries and the Riverside Arts Council. My piece is titled, "Story Time". The exhibit is now over, but posters of my art and the art of the other four artists can be purchased for $10.00 at Riverside Community Arts Association. Riverside holds it's monthly Arts walk on the first Thursday of every month from 6 p.m. to 9 p.m. Hope to see you there! Greg and I will be teaching a very special class at the Mission Inn Museum Store, outside on the mall. The class will include detailed instruction on creating a Mission Inn scene for your home. The approximate size of the piece will be 8'' x 11''. The Mission Inn is a California landmark which has been an inspiration in much of our work and we are very happy to share this in an exciting 2-day outdoor class at the Mission Inn. Two pieces of my art have been purchased by the City of Riverside to hang at the Marcy Branch Library. I am very excited and hope everyone can come to the Grand Opening on Saturday. If you are not able to make in on Saturday, I hope you will visit the Marcy Library soon! Cathy Maxwell is a recent convert to the world of art. 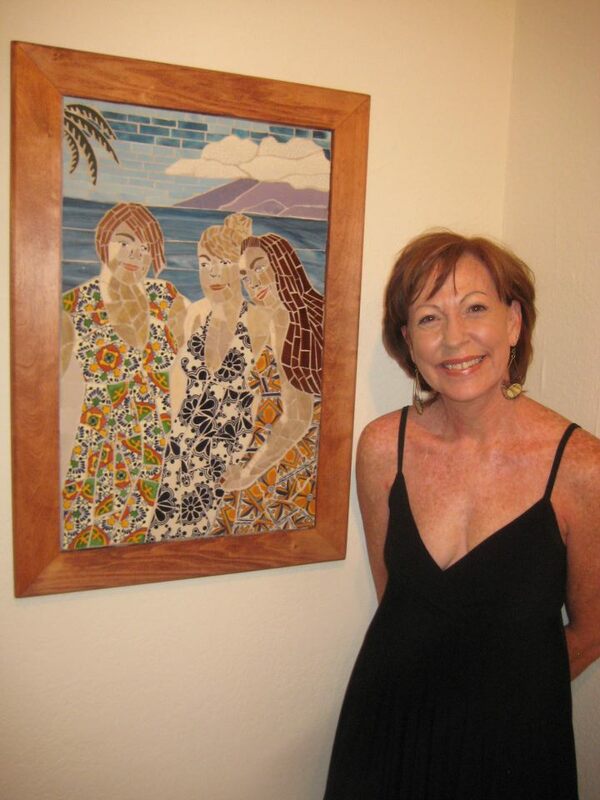 The self-taught mosaic artist spent many years involved in the daily activities and community events connected to raising her children before she embarked on her creative path. Once she unleashed her creative instincts, she was totally hooked and has achieved newfound freedom in the process. Maxwell began her art career by utilizing the technique of Pique Assiette, a folk-art mosaic process incorporating broken bits of plates, cups, tiles and other found objects. "I found that the rhythm of making mosaics was very therapeutic and calming ... not to mention the fact that breaking plates with a hammer is very liberating!" Maxwell said. Over the past five years, Maxwell's artistic talents have blossomed and received both critical and public acclaim. In 2006, Maxwell and her collaborator/husband, Greg, created a public art sculpture titled "Under the Citrus Sun" as part of the Riverside Art Museum/Art Alliance's Giant Orange ARTventure. The sculpture is now on permanent public exhibition at the Riverside Plaza. Another giant orange sculpture was commissioned in 2007 by the city of Riverside to commemorate the 50th anniversary of Riverside's sister city relationship with Sendai, Japan. Her mosaic "Once Upon a Midnight Page" was selected as one of the winning designs in the Riverside Community Arts Association "Imagining the Future of Reading" poster contest in conjunction with the Riverside Public Library. Working on mosaics has facilitated Maxwell's ability to feel lost in time in a creative zone that offers many rewards. Maxwell said, "Before I began creating mosaics, I viewed my everyday life and the world around me moving at such a fast pace and I hardly ever looked up to take a breath. Now, with my ever present mosaic work in mind, I have slowed my pace and see potential everywhere I look. I return to my studio with visions of images yet to come." "Once Upon a Midnight Page" by Cathy Maxwell was one of the winning designs in a poster contest. Maxwell turns her colorful visions into commission pieces and other works that she exhibits at the Riverside Community Arts Association and various locations in the Inland region. Her future plans include teaching mosaic classes at her new home studio. For more information about the Artist Spotlight, please contact Daniel Foster at The Community Foundation at 951-684-4194 951-684-4194 or DFoster@thecommunityfoundation.net. "Francesca" a portion of a mosaic by artist Maxwell. 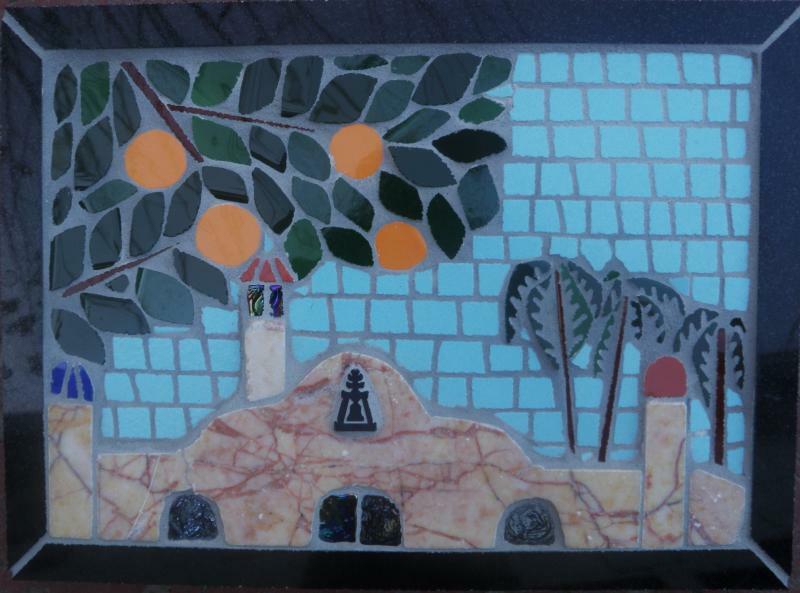 DOWNTOWN: Mosaics will be featured at the Riverside Community Arts Association, 3870 Lemon St., Riverside, through July 18. RECEPTION: There will be an opening reception July 2, 6-9 p.m. during Riverside Arts Walk on First Thursday. "Imagining the Future of Reading 2008"
"Once Upon a Midnight Page"
Cathy was one of five artists chosen by the Riverside Arts Council to have their art photographed for an art poster. Posters may be purchased at Riverside Community Arts Association for $10.00. Greg and Cathy depart for Sendai, Japan with the Citizen's Delegation from Riverside, California. Big orange sent to sister city // EXCHANGE: The gift marks the 50th anniversary of Riverside's relationship with Sendai. Riverside said farewell to a symbol of its citrus heritage Tuesday, packing up a giant sculpted orange for shipment to its sister city Sendai, Japan. The orange was created by artists Greg and Cathy Maxwell as Riverside's gift to Sendai. It was part of the 50th anniversary celebration of Riverside and Sendai's sister-city relationship. The orange was unveiled in March at White Park, along with the dedication of Sendai's gift to Riverside: a Japanese garden in White Park designed by a team of Japanese landscape designers. "Gosh, I can't believe it's finally leaving," Cathy Maxwell said as she watched workmen loading a crate holding the orange into a DHL shipping van. The orange will head to the DHL hub at March Air Reserve Base and then be flown across the Pacific to Narita, Japan. From there, it will go to the Sendai International Center, said Gilbert Ortiz, DHL's Riverside station services manager. The orange will travel about 6,114 miles, he said. This is the second giant orange worked on by the Maxwells. The first was created as part of the Giant Orange Artventure held by the Art Alliance and Riverside Art Museum in 2006. "I think we really perfected the design," Cathy Maxwell said of the Sendai orange. Along with landmarks such as UC Riverside, the raincross symbol, the Mission Inn and Mount Rubidoux, the 4-foot-tall sculpture features the intertwining trunks of orange and flowering cherry trees. The orange tree represents Riverside and the cherry tree represents Japan. Toshihiko Nishimura, deputy director of the U.S. office of Tohoku University, a 100-year old institution in Sendai, was in Riverside to represent his city. Cathy and Erin exhibited mosaic work in this exhibit. Under the Citrus Sun: If you see no other giant orange this summer, see Greg and Cathy Maxwell's masterpiece mosaic. The landmarks (Mt. Rub, Mission Inn, etc.) are vivid and exquisite. But it's the painstaking detail (palm trees, red-tile roofs) that puts this Giant Orange tiles ahead of the pack."